"William Henderson writes some of the most evocative and transcendently beautiful prose in contemporary American literature. 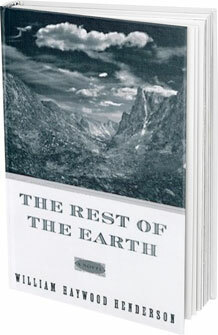 The Rest of the Earth is a work of art more like a series of paintings than the traditional novel. The high and remote Wyoming landscape—obdurate, dangerous, violently beautiful—is the great presence in it. Against slant rock and the long view we catch sight of a drift of characters whose lives brush against each other, blow away like smoke." "An epic tale masterfully told. An astonishing novel. Related with extraordinary precision. There are pages of descriptions of the kind that entranced 19th-century readers that all but disappeared from fiction after the coming of movies and television. The period detail is exact and convincing. So are the many descriptions of ever-changing yet unchanging nature, the hills, lakes, vegetation, and wildlife. Henderson has been in these places, seen, smelled, heard, and felt the imprint of all these things." "The Rest of the Earth should be compared to Larry McMurtry's Lonesome Dove, Gretel Ehrlich's Heart Mountain, and Pete Dexter's Deadwood. It offers us a carefully imagined vision of what it might be like to live through the senses...in a landscape more vast and strange than we can readily imagine." "Mesmerizing. This extraordinary book will awaken your senses. ...Henderson's greatest strength as a writer is in his prose, steeped in detail and hypnotic in rhythm. Whitmanesque sensuality infuses every word. Henderson's almost mythical bond with the natural world makes Walden look like a walk through a city park." "Plot details can't start to convey the hypnotic attractions of place in this walkabout through the wilderness that transforms near-random events into a mysterious evocation of human longing at its most extreme." "Henderson's novel is set in a wilderness that staggers the imagination. Mesmerizing and beautiful...as mysterious in its portrayal of character as it is in terms of rocks and stars."